EK-ACF ALU Fittings (Advanced Compression Fitting) are 10/13 soft-tube compression fittings designed for use with flexible soft tubing. With a high-quality finish, the EK-ACF Fittings are an aesthetically appealing and secure option for your cooling loop. The locking ring prevents the flexible tube from being pulled out of the fitting by compressing the tubing wall underneath the ring. 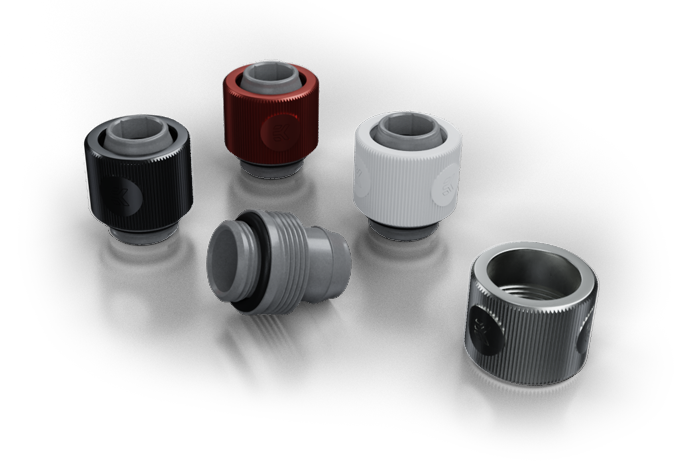 EK-ACF ALU is a secure variant of the tubing fitting connector as the locking ring prevents flexible tube to be pulled out of the fitting. The locking ring compresses the tubing wall underneath the ring and it does not require any hose clamp or similar substitute. This makes it aesthetically more appealing than the ordinary barb fitting. These fittings sport low-profile design hence it is recommended to handle the fitting barb using Allen Key 8mm. Do not mix EK Fluid Gaming series fitting with brass, copper any other type of metal-based parts in your liquid cooling loop! Do not use any tools to secure the locking ring to the fitting barb.